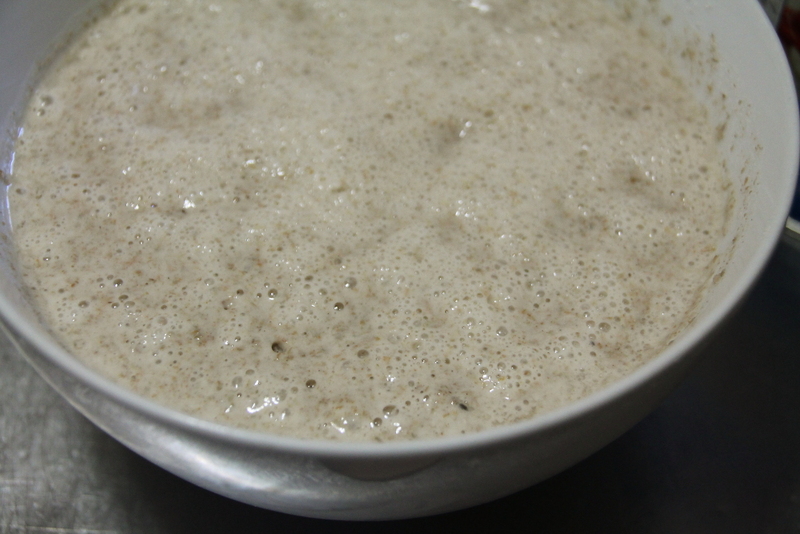 Here is another recipe you can do with your leftover sourdough starter. This is really easy to make and great to freeze for an easy meal. Start by making your pie crust. You will need to refrigerate it for a couple of hours to make sure that it is nice and cold. 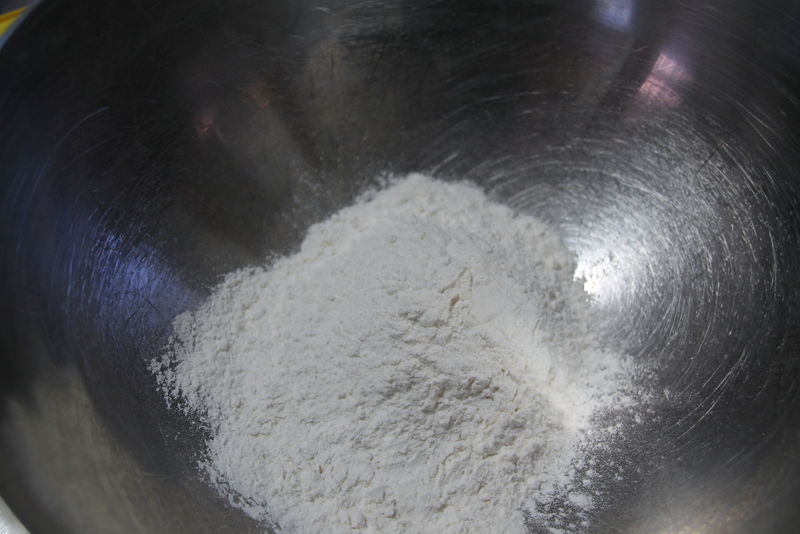 Put flour, shortening, salt and sugar into a bowl. Because my hands can get extremely warm I cut the shortening with a pastry cutter to avoid melting the shortening. 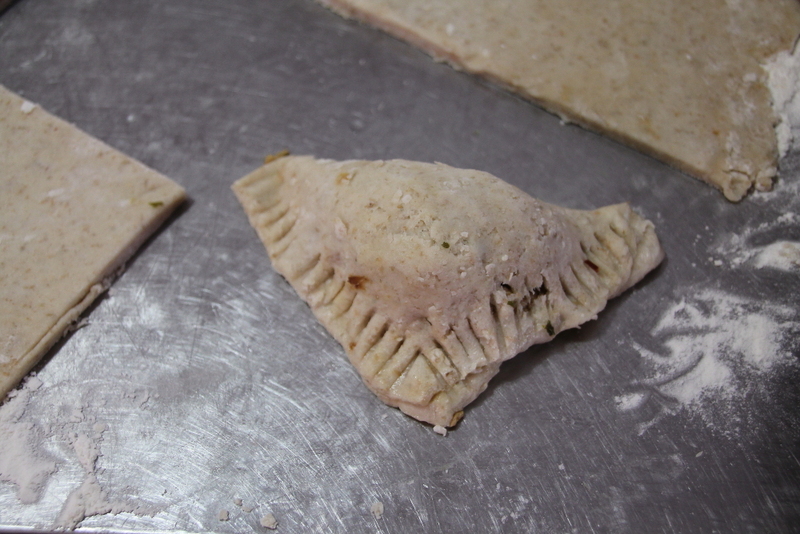 Like any pie shell, the key to get flaky crust is to cut the shortening into tiny pea sized pieces without melting it. If you don’t have a pastry cutter, you can use a butter knife and cut the shortening into pieces. Once the shortening looks like pea sized pieces you can add the sour dough starter. 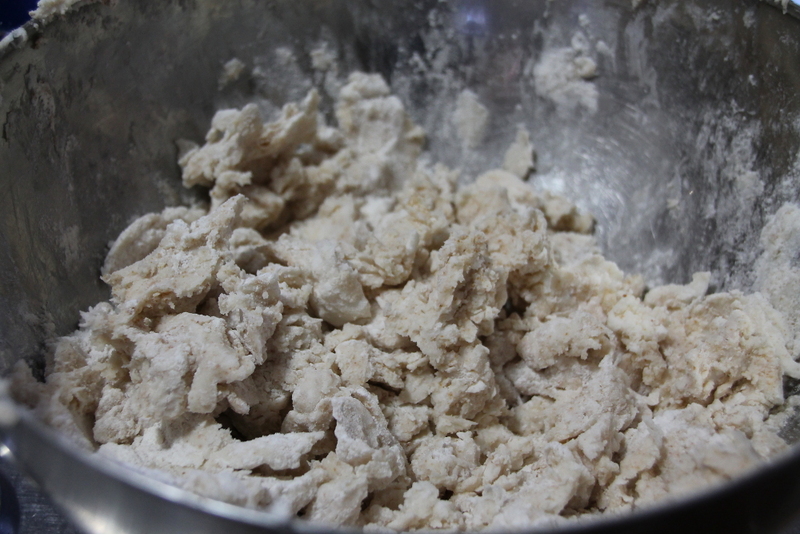 Mix well and add more flour if the dough is too wet. Knead the dough lightly until the dough sticks together. 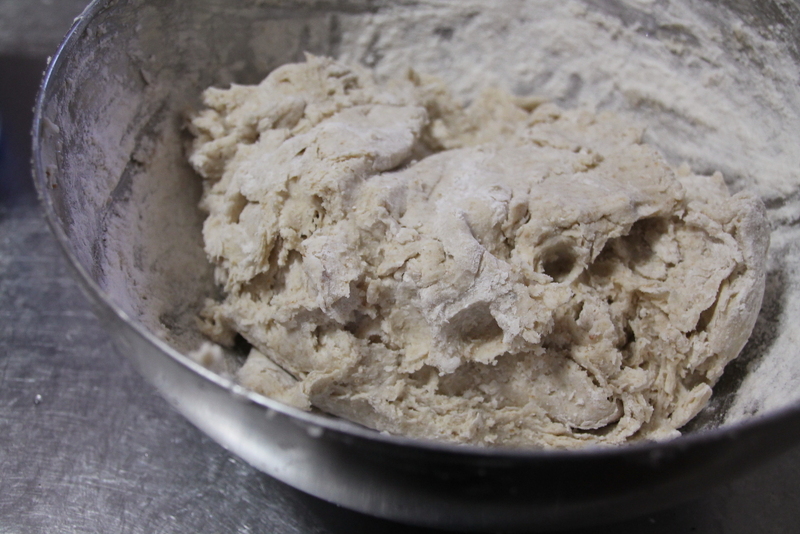 Try not to knead too much as it will melt the shortening and it will make the dough tough. Cover the dough with plastic wrap and refrigerate for a couple hours. While the dough chills, make the filling. 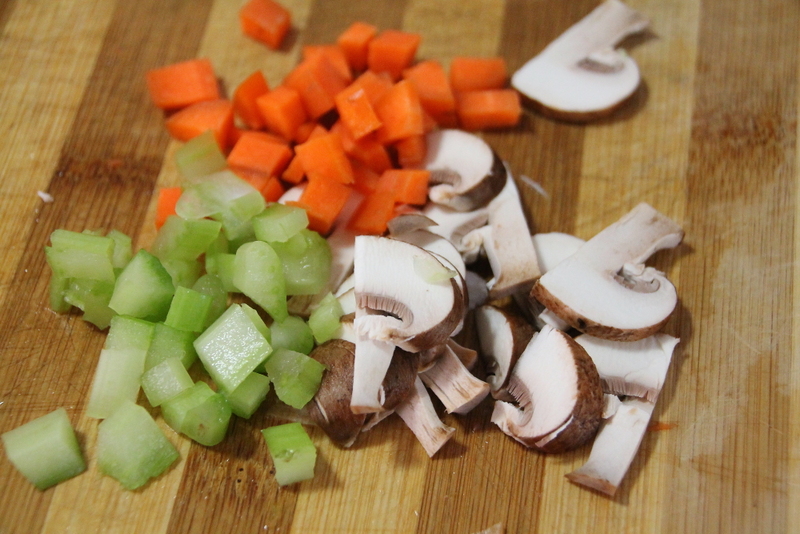 The veggies that I always use are mushrooms, carrots, celery, onion and garlic. These make up lots of my recipes. For seasoning I used mustard, Worcestershire sauce, cumin, paprika, parsley, salt and pepper. 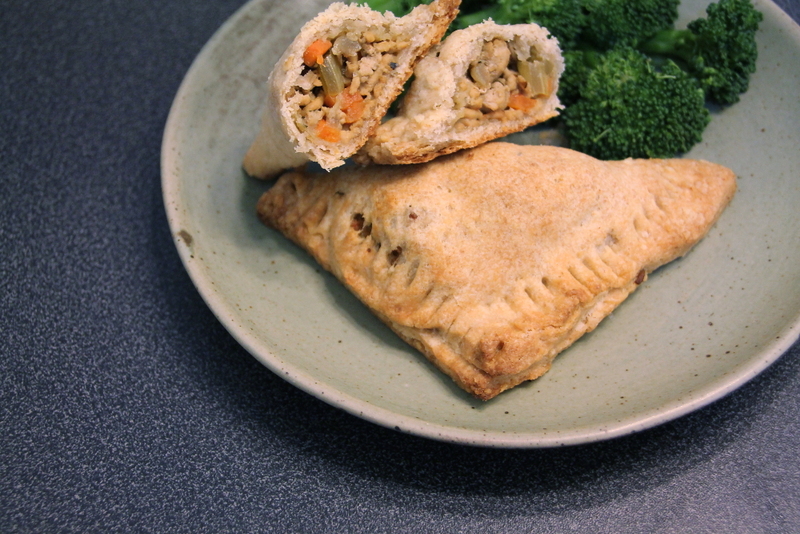 Because I wanted to make it easier to fill the meat pies, I diced the veggies into small pieces. 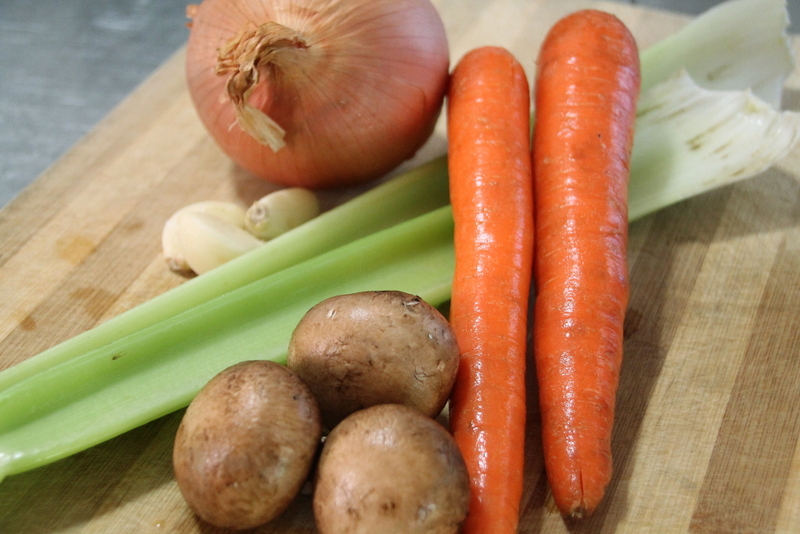 I also like to cook the vegetables separately so that they cook evenly. Saute the onions quickly to soften. 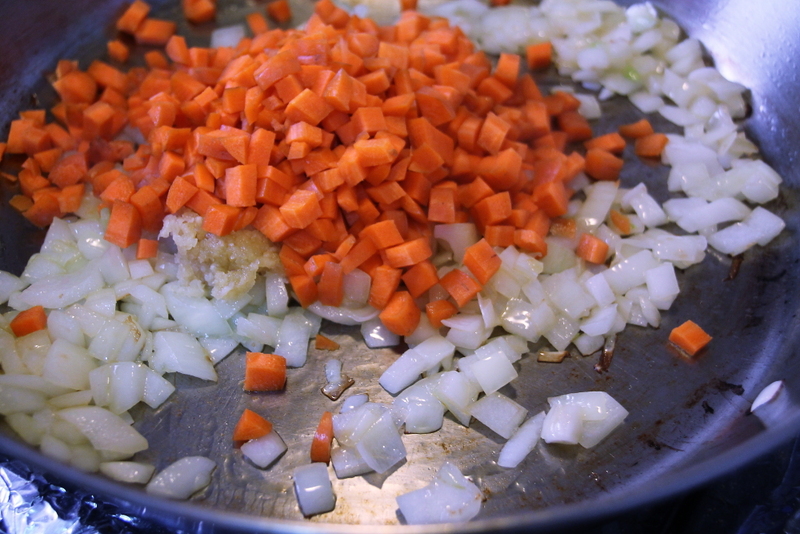 Add carrots and garlic. Place in a large bowl. Next saute the mushrooms in plenty of oil. 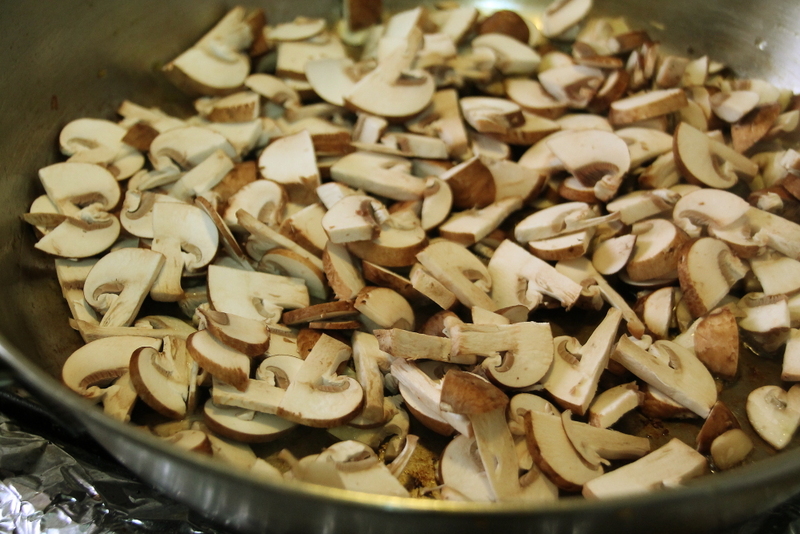 Just like meat, don’t stir until the mushroom brown on one side.Place the mushrooms into the bowl. Brown the turkey and season with the mustard, Worcestershire sauce, salt, pepper and spices. Most of these I add depending on taste. 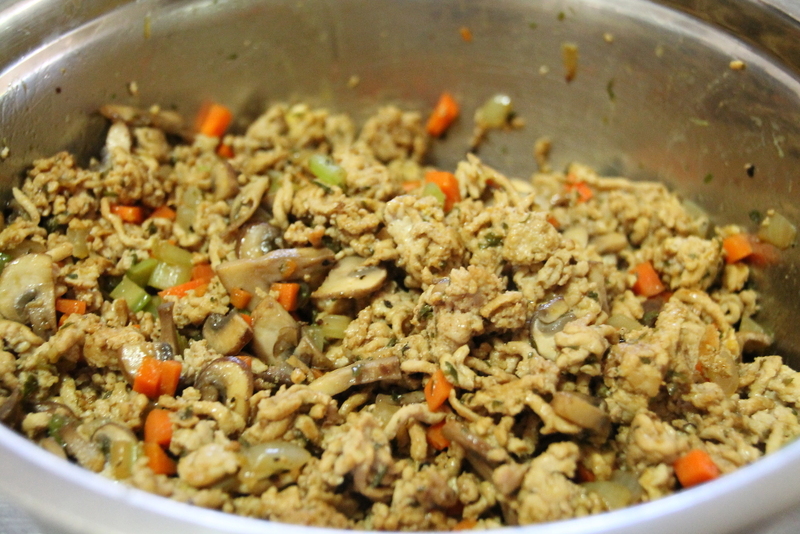 Mix all the veggies and mushrooms together and allow to cool. This makes stuffing the pies easier. When you are ready, preheat the oven to 350 degrees. 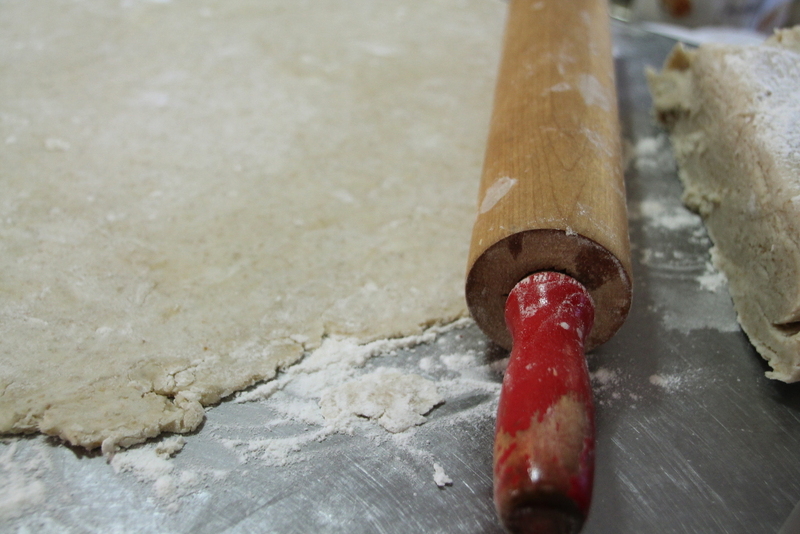 Cut the dough into smaller pieces as this will make it easier to roll. I cut mine into two pieces. Roll until the dough is about 1/4 inch thick. Cut into 3 in by 3in squares. Place a tbsp or more of filling. 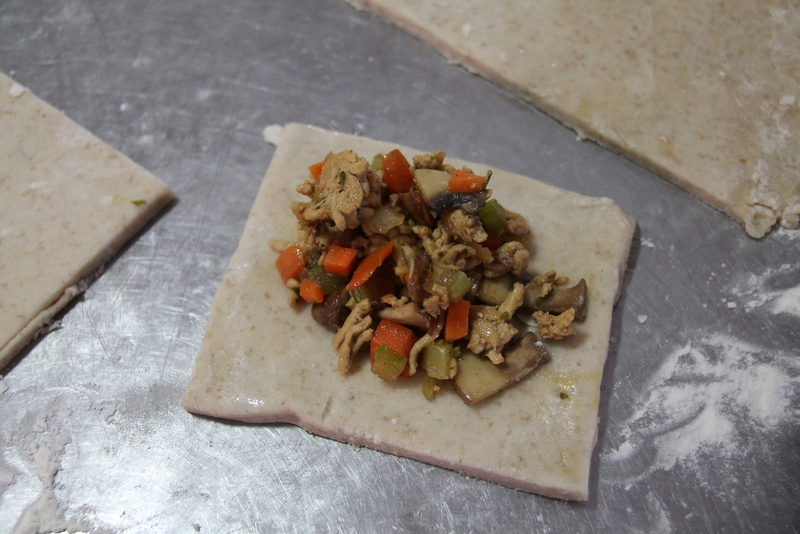 Wet the edges of the dough and fold it to form a triangle. Use a fork to press the edges down. 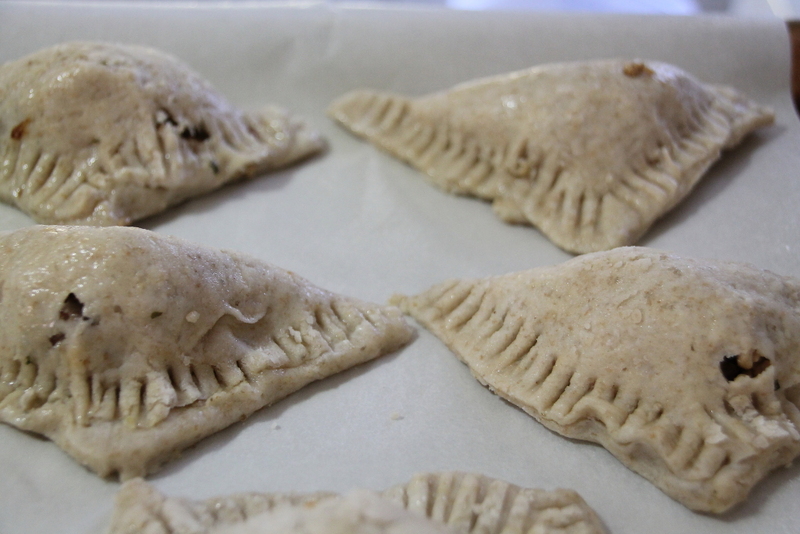 Place the meat pies onto parchment paper lined pans. Lightly spray the pies with oil. Bake for about 30-40 minutes until golden brown. When they are ready place onto cooling racks. 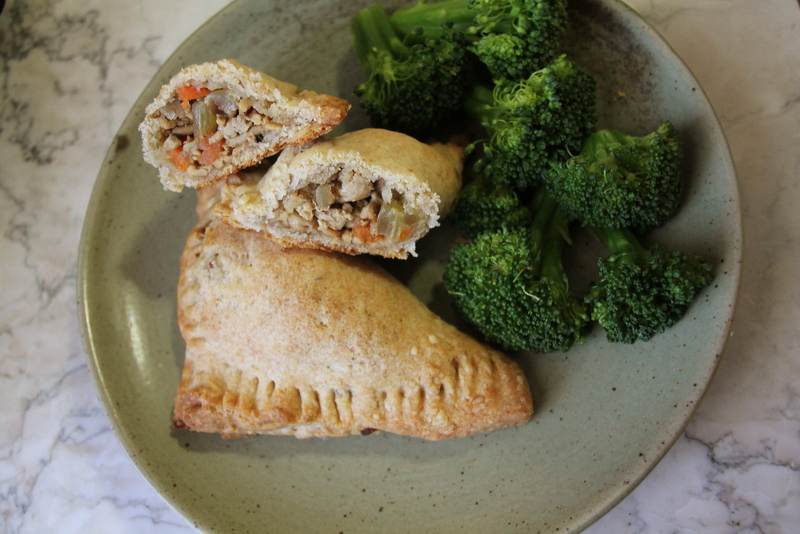 These are great for quick meals or meals on the go. You can freeze them and microwave when you want to eat them. 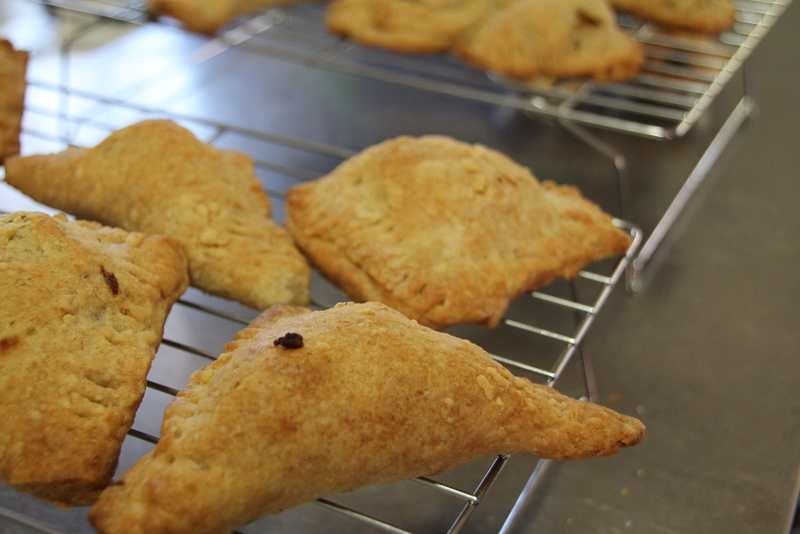 They are flaky and meaty. So yum. Combine the flour, salt, and sugar in a large bowl. Cut in the shortening using a pastry cutter or with a butter knife. You will end up with pea sized pieces. 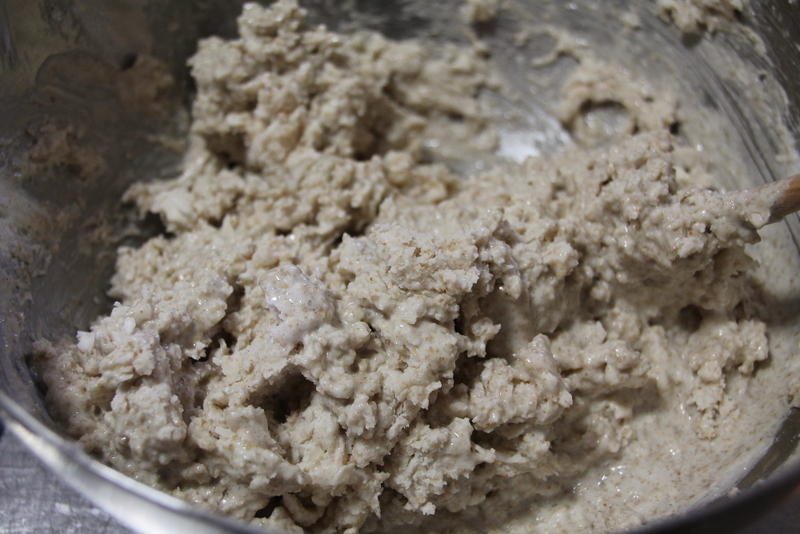 Add the sourdough starter and knead. You might need to add more flour if it is too sticky. Add enough flour so that the dough ball comes together. Do not over knead. Cover with plastic wrap and place in the fridge to chill for a couple hours. Saute vegetables individually so that each cooks evenly. Brown the turkey meat and add mustard, paprika, Worcestershire, cumin, parsley, salt and pepper to taste. 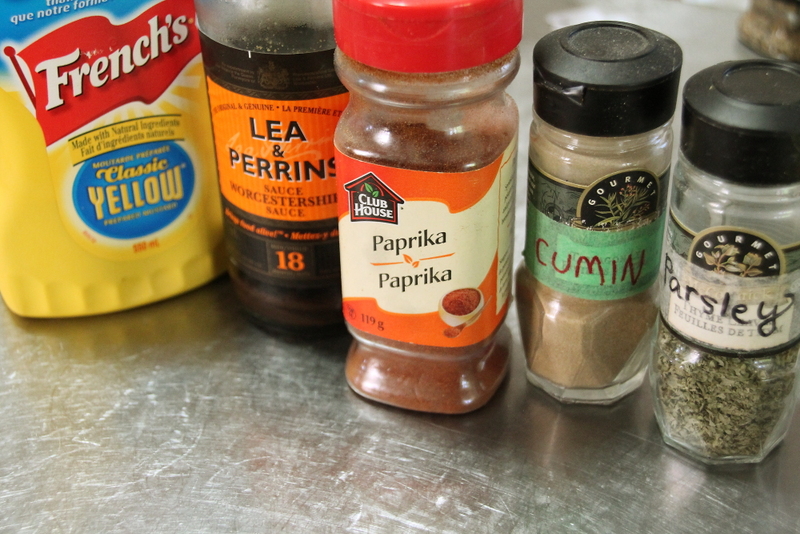 Mix all together and taste again to see if you need to add more seasoning. Allow to cool. 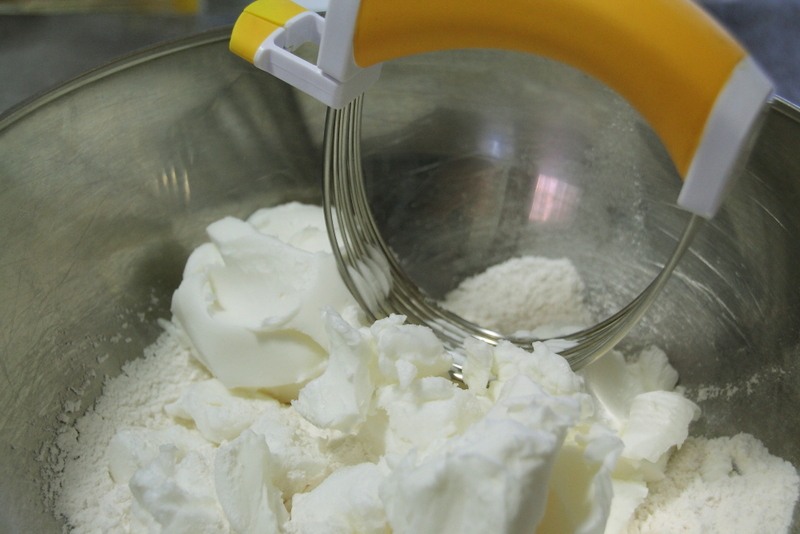 When ready, remove dough from the fridge and cut into two pieces. Roll until about 1/4 inch thick. Cut into 3 in by 3 in squares. Place a tablespoon into the middle of each square. Wet edges of the dough with water and fold diagonally. Press with a fork. Lightly spray the pies with oil. Bake or about 30-40 minutes until golden brown. Allow to cool on a cooling rack. I made about 15 pies. I also had tons of filling left and made fried rice with it.